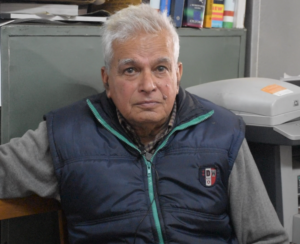 By SM Sethi (writer & historian) The stone temples of Chamba deserve an attention, for the temples of this type were the first to fall prey to iconoclasts raiding the north Indian plains. Thus the temples contained in this sheltered mountain range represent the mightiest and the most numerous group of nagara temples topped by massive beehive shikhras, found anywhere in the northwest Himalayas. 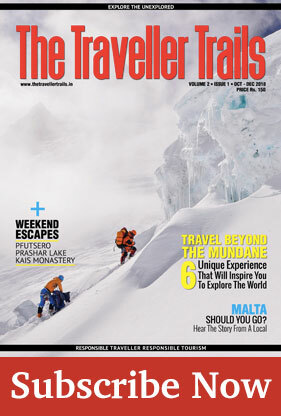 The ancient texts speak of them as nagara temples for in the Gupta period. The tradition holds them to be of SAM variety for they face the direction which is cardinal though not necessarily the direction prescribed by the texts. They are also named as BHUMIJA or the temples born of the earth as they rise straight from the earth without any platform. The art historians also call them of ghat-pallava-rudha for the motif of vase and foliage (ghat-pallava) was dear to the Gurjara pratiharas or the Rajput rulers and applied so profusely on the body of temples that the temples themselves came to be known as ghat-pallava -arudha. These ancient temples stand at the crossroads indicating the ancient town planning of Chamba which according to Vastu texts are marm-sthala or the sensitive points where the bhutas, the goblins or the evil spirits lurk. The wheel roof above them is a later addition meant to ward off the effects of rain and snow and acts as a parasol to indicate the spiritual sovereignty of the deity. The Vastu texts speak of stone temples as (masculine) purusha, while the other secular buildings as feminine hence should be clay or wood. The ancient texts speak of decorating the nagar temples with such motifs and symbols as were revealed to the demons and gods during the churning of the ocean. Out of these symbols and motifs, the ghat-pallava (amrit-kalsa) and diamonds (ratna) were the most preferred and employed most profusely by the silpins of Chamba. Other motifs found are the nagas (serpent) who move around the temple thus protecting it from any harm. The elephants appear on the base mouldings for they are earthy and signify the mundane aspect of the cosmos. In the ancient texts their gait is considered majestic and full of beauty (gaj-gamini).The hamsas are light and pure, sacred and full of air and represent the flight of the soul (parma-hansa). Of the panch bhutas the hamsas thus represent the vayu aspect, the elephant the earthy aspect, the nagas the water element, the akasa or the ether is represented by kalsa on the top and the mulmanjari of the temple by agani itself. The doorway of the temple is its most important part. The devotee may not cross the thresh hold for beyond it in the chamber resides the jiva of the temple in the form of godhead or mulnayak. It is the doorway which demarks the worldly from the non -worldly, the conscious from the subconscious and, the spiritual from the mundane. The inner sanctum of the temple is dark, square and simple for its represents the garbha grihya or the womb in which resides the jiva of the temple throbbing with life. Hence the sanctum is dark square and simple and without any opening. 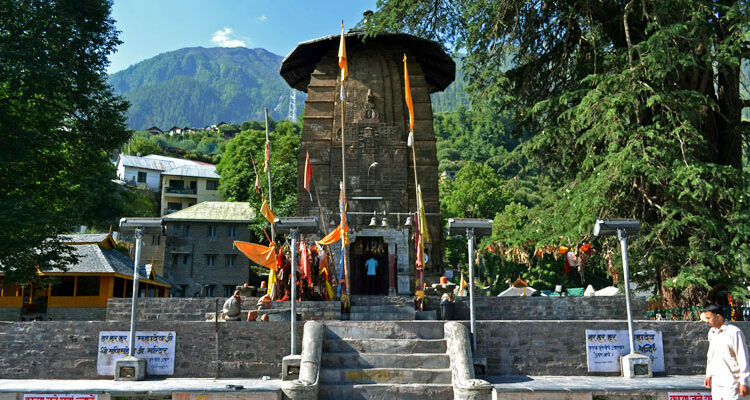 The doorway of the temples in Chamba is divided into many shakhas, the most important being the frontal shakha where the figures of Ganga and Yamuna are carved at the base. 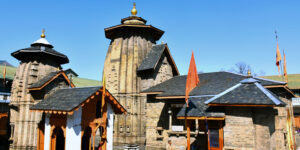 The temples in Chamba are fronted by a two pillared porch which is known as antrala. The antrala shelters the devotee from the world and here he stands, paying obeisance to the deity and leaving the material world behind and the spiritual world ahead. The mandaps in Chamba were added to the temple and many a times renovated because they were made of wood which is impermanent and of perishable nature. In the initial stages the stone was frequently kept in position without cementing material. But we also find iron dowels being used. Usually, the vajra lepa was used in which a compound of mash, powder of conch shells and lime etc are employed. The biologists are of the opinion that the stone employed for the Chamba temples was of pre-Cambrian state of earth formation and were procured from the quarry which was about 22 km distance from Chamba. 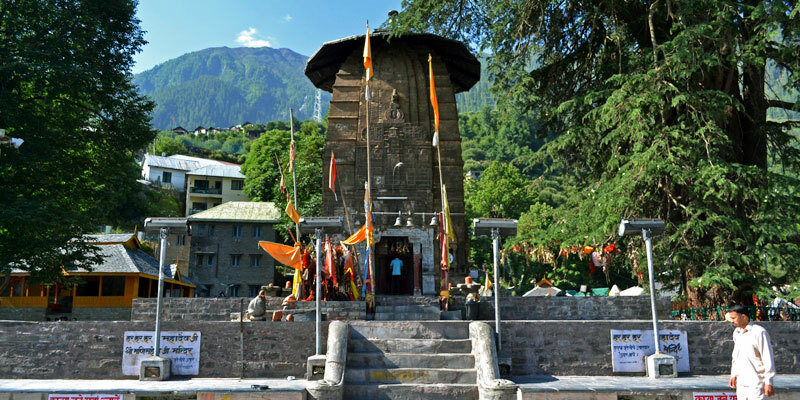 Like the Chaurasi complex at Bharmour, the ancient temples of Chamba came to be concentrated at one single place. The temple of Lakshmi Narayan, the first temple which was commissioned is the highest and mightiest of them all and sets the standard and serves as a model for the later temples to come so that all the temples look alike and repeat the vertical and horizontal division as well as the motifs with little or no variation. They seem to be the product of one cultural epoch. At times the Muslims motifs too have crept in. It is not possible to tell about the influence in the style of these temples except that they can be classified as North Indian temples bearing influence analogues to Osian or Orrisa temples but are more provincial in outlook.